A fatigued flight crew landed long on a wet runway with standing water at Lorient, France, according to a BEA accident investigation report. Their CRJ700 passenger jet suffered a runway excursion as a result. On October 16, 2012, Brit Air Flight 937QL departed Paris-Orly, France on a night time domestic flight to Lorient. The captain was pilot flying. It was the fifth and last flight of the day for the crew. Weather at Lorient was poor with heavy rainfall and a visibility that decreased to 2000 m during the approach. Winds were from 160° at 17kt with gusts to 26 kt. The flight crew opted for an ILS approach to runway 25 (CAT I), with a four knot tailwind. 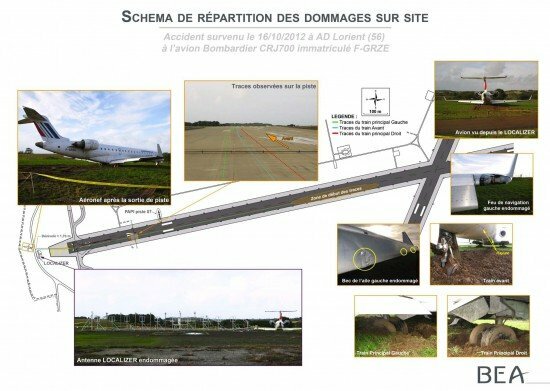 At 21:10, the controller reported the wind conditions and reported that “the runway is wet with puddles (mouillée avec flaques d’eau)” and that the preceding aircraft had difficulties during landing due to aquaplaning. At 21:20, the aircraft was established on the ILS at an altitude of about 1900 ft and a speed of 180 kt. Planned approach speed Vapp was 140 kts. The autopilot was engaged. The flight was cleared to land and at 1000 ft, with a 4 knot tail wind, the aircraft was established on the ILS with a speed of 144 kt. The speed increased to 154 knots at the time the airplane passed 500 feet. The autopilot was then disconnected. The airplane crossed the threshold of runway 25 at a height of 56 feet and at a speed of 153 knots. The copilot reported to the captain that visibility was poor and that they were slightly left of the runway centreline. Nine seconds later, the main gear touched down about 1130 m from the threshold of runway 25, which is 2230 m long. The ground speed was 140 kts. The spoilers were then deployed and the crew deployed the thrust reversers, appying maximum reverse thrust. The airplane did not decelerate as expected and left the runway at a ground speed of 66 kts. It struck localizer antennas before coming to rest about 200 m from the threshold of runway 07. The crew issued a distress call and ordered the evacuation of the aircraft. The BEA investigation agency concluded that the crew failed to abort the landing because they were insufficiently aware of the extent of the runway contamination and the remaining runway length upon touchdown. The level of performance of the crew was also degraded by fatigue and routine. Adding to that, the controller used non-standard phraseology to describe the runway contamination. The characteristics of Lorient’s runway 25 were undocumented in Brit Air’s Operations Manual. Also, the airport had failed to correct shortcomings on runway 25 in a timely fashion.